Talk about looking at the glass as half full. The Los Angeles Chargers, planning ahead, are already resisting any hint of the NFL moving the AFC title game outta their rented digs in Carson, even though that stadium seats a max of 27,000 fans. More to the point, it's even though they'd have to get through the New England Patriots and Kansas City Chiefs to make it a relevant one. Dream or no, those are tall orders, and first up is a clash with that perennial playoff power, the New England Patriots. Bovada's posted numbers that give the Bolts some serious respect. 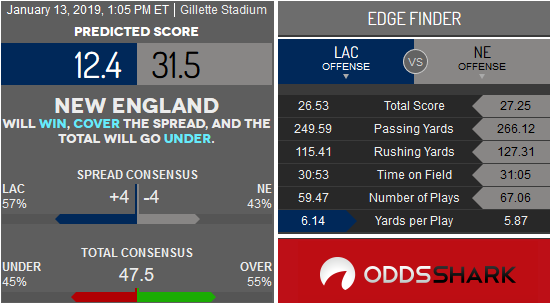 They've set the line at New England -4 and the total at 48, with the moneyline being the Los Angeles Chargers +160 and New England -180. Based on an NFL calculation that's almost as arcane as QB ratings, the Chargers played a stronger schedule and had a record -- 12-4 -- that was one game better than the Patriots. As has been discussed ad nauseum, the team's not even popular in their temporary home. They've basically played their entire season on the road. So, they're battle hardened. Need further proof? Phillip Rivers, Melvin Gordon & Co are now 8-1 ATS on the road. Well, start with the QB comparison. Big data shows Tom Brady's 7-0 SU against Rivers. These two teams met in Foxboro in Week 8, with the Pats' 21-13 victory actually flattering the Bolts to deceive. The game was never really that close. Toss in the fact New England's 8-0 SU and 6-2 ATS in eight home games this season with an average win margin of 16.2 points. It's beyond clear they're quite cozy in Gillette Stadium. The last time dudes lost a home playoff game was in 2013. The Patriots have gone under in four consecutive home dates. The way the Chargers defense throttled Baltimore last week and contained an RPO dude like Lamar Jackson offers a hint that they could cause problems for the immobile Brady. Points could be at a premium.